NEWINGTON - Sharon Sherpa did everything she could to keep the Newington field hockey team in the game Monday afternoon. 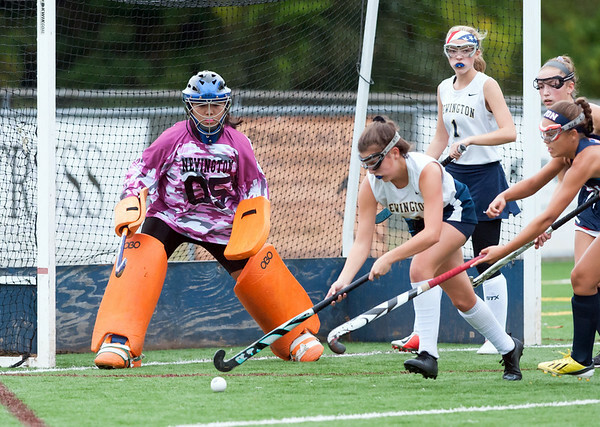 The goalie faced pressure for most of the 60 minutes as Newington struggled to transition into its offense. As a result, Sherpa allowed seven goals, but the 12 saves she made told the story of her performance in goal. It could have been much more than the 7-0 loss to Avon. Sherpa especially shined in the first half of play with just three goals against her. While the goals kept coming for the Falcons, Sherpa had the same mindset in net. Newington fell to 2-6-1 with the shutout loss but the Indians senior goalie had a stronger performance than the scoreboard showed. Posted in Newington Town Crier, Newington on Monday, 15 October 2018 20:34. Updated: Monday, 15 October 2018 21:09.